Green infrastructure stormwater systems use natural processes and green technologies to manage stormwater and improve water quality. What are the Benefits of Stormwater Systems? Adaptation: Green infrastructure stormwater systems help manage the impacts of severe weather, particularly from increased precipitation. Flooding: Green infrastructure stormwater systems mitigate flood risk by providing permeable surfaces for stormwater to be absorbed into the ground. Water Cycle: Green infrastructure stormwater systems absorb rain water, which helps sustain infiltration to aquifers, recharge groundwater reserves and maintain base flow in rivers. 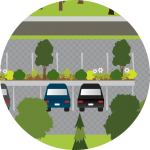 Clean Air and Water: Green infrastructure Stormwater systems safeguard the quality of our drinking water by reducing erosion and preventing stormwater from flowing into streets or parking lots where it can pick up contaminants. When vegetative technologies are used they also improve air quality by removing pollution and particulate matter from the air. Aesthetics: Vegetative green infrastructure stormwater systems bring nature into urban areas and can provide attractive features that improve the aesthetics of a streetscape or parking lot. Capital Cost Savings: Green infrastructure stormwater systems can have lower up-front project construction costs for the same level of service as ‘grey’ infrastructure solutions. Lifecycle Cost Savings: Green infrastructure stormwater systems can reduce maintenance costs and offer extended lifespans which provide long-term cost savings. Cost of Floods: Investment in green infrastructure stormwater systems can prevent large-scale damage and reduce the financial impact of floods. Green Jobs: Green infrastructure stormwater systems create design, construction and maintenance jobs.